Curaçao's city center was formed around the shores of the Sint Anna Bay, which is also the gateway to Curaçao’s biggest inland bay, Schottegat. This unique natural deep harbor is directly connected it to the caribbean sea. The shopping districts Punda and Otrobanda are connected by a one of a kind floating bridge, called the Queen Emma Bridge. In 1969 a second bridge, the biggest bridge on the island, was built connecting the east and west. It has been named after Queen Juliana. The bridges are of great importance in connectivity on the island as the majority of life and business activity concentrates around the Sint Anna Bay. Large parts of the city and its wharfs were designated as Unesco World Heritage sites in 1997. On each side of the entrance our famous forts are located, resonating the rich history of Willemstad. Also in Punda the oldest Jewish Synagogue of the western hemisphere is situated, it was built in 1732. 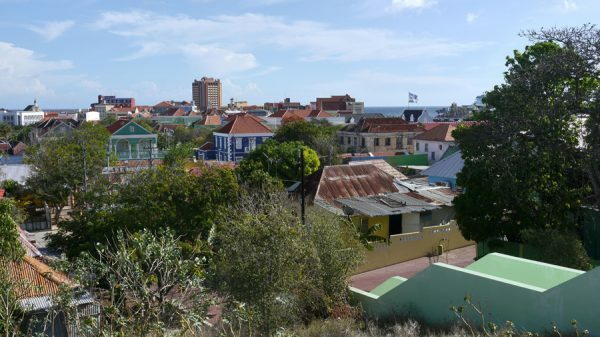 Willemstad was the capital of the islands in the Dutch Antilles till 2010. On 10-10-2010 Curacao became an independent country within The Dutch Kingdom and is now the capital of Curaçao. The quarters Scharloo, Scharloo Abou and Pietermaai also form part of Willemstad.The majority of colonial styled villas are situated in these urban district. All 4 quarters in Willemstad; Punda, Otrobanda, Scharloo and Pietermaai, are within walking distance from each other. A scroll between these quarters is a must for visitors from abroad. Its narrow streets surrounded by monumental buildings built during Curacao’s rich colonial past is unique. It is the best way to experience island life in our historic city. The Waaigat, an inland water which is part of Sint Anna Bay, lies between Punda, Pietermaai, Scharloo and Scharloo Abou. Because of the 3 bridges connecting Punda and Scharloo Abou, there is ample interaction between the areas. Close to the shore of the Waaigat there is the national market, we call it Marshe Nobo or Marshe Rondo, it a big unique concrete building where small local farmers, fishermen and traders display their merchandise. Venezuelan traders anchor their boats at the mouth of the Waaigat to sell fruits to passing citydwellers from the famous floating market. In and around the shopping districts in Punda and Otrobanda a lot of people resided during the era’s. The hills around these centers are like a maze with small streets, allies and corridors. The small squares and corners in between the streets is where inhabitants like to come together to connect. It is part of our culture. For generations many people with roots in these neighborhoods have always kept a special connection and still do. It is an upcoming trend for new generations and young families to consciously move to these parts of Willemstad as they enjoy the bustling vibe of city life. As Curaçao grew in population and people become more mobile many new suburban centers formed all over the island, like Salina, Santa Rosa, Santa Maria to name a few. Also locations along the main roads became popular for vendors to establish new business. As people become more used to conveniently shopping by car, visits to the old city centers became less frequent. Because of these new developments everything become available closer to home. The last 10 years the government and certain organisations have been focusing on bringing new life to its old city center. DMO and SKO, associations representing stakeholders in Punda and Otrobanda, are channeling their joint forces on reviving the shopping experience in the old city streets. What the governments and stakeholders are considering is how to come to a balanced mix of activities that attract visitors to Willemstad and how living in the old city can raise in popularity. Next to boosting the local economy this would have great benefits for the island. With this mindset a new large Cruise terminal was built in Otrabanda and even a second one years after. Attracting the right investors in real estate development and hospitality is crucial in reaching these goals. Maybe the biggest challenge of the era would be, the termination of the Oil refinery activities in the St. Anna Bay at the end of the 2020. The effects from decisions to be made around the oil refinery business can have big implications on Willemstad and the dynamics of a small island economy as a whole.